Profold’s presents the New PRO+ II Tabber. 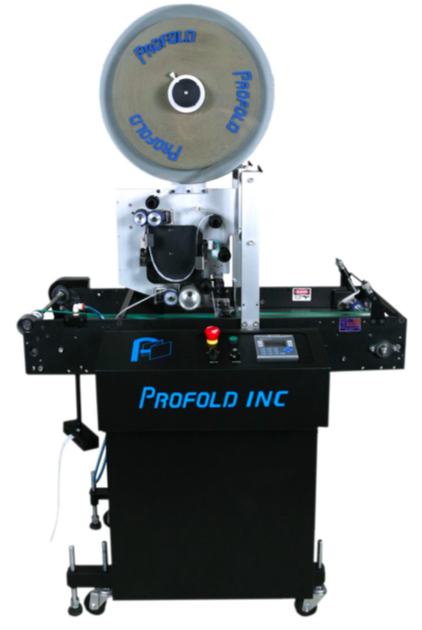 Symco Group resells the entire line of new Profold solutions including the Profold Pro+ II Tabber. If you are interested in learning more about the Profold Pro+ II Tabber or another Profold solution, please contact Symco Group at 800-878-8002 or info@symcogroup.com. It will provide you with the proven performance, increased production capabilities, and reduced operator interfacing that you’ve come to expect from a Profold Tabber and the best ROI possible today. The PRO+ II Tabber combines the proven capabilities of PROFILED TABBERS with the benefits and simplification of the RSC TABBER while keeping it at the same basic price as the standard PRO+ II. Same Low Price More Value and Benefits! The PRO+ II TABBER is Profold’s newest addition to its Tabber line-up. It was designed to respond to customer requests we’ve received for a tabber that combines the proven abilities of the Linx Tabber family with the new benefits provided by the RSC Tabber without increasing the price. Well, here it is, The New PRO+ II TABBER! The PRO+ II TABBER provides improved production, reduced operator interfacing, better ROI and gives the customer the ability to “customize” their Tabber the way they want it. They can now add the options they want. 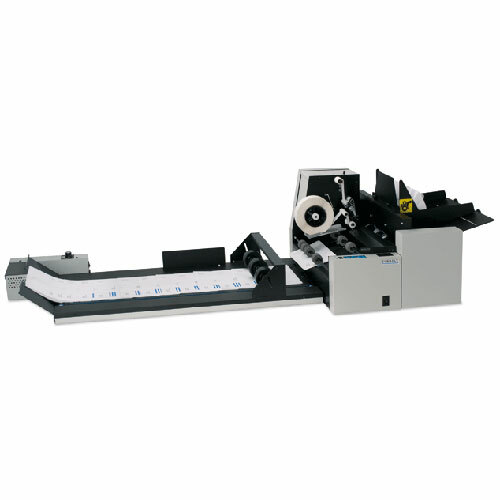 Formax Tabbing Systems include the Formax FD 260, which uses “crush tab” technology to apply postal tabs to foiled mail pieces. The Formax FD 280 system applies multiple edge tabs per piece, up to 3 per pass. 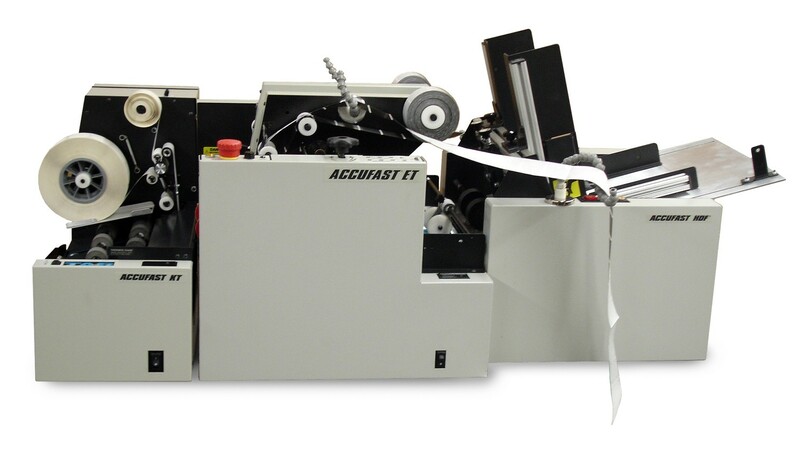 The Formax FD 290 system combines the FD 280 and FD 260 for one-pass tabbing of booklets and more, applying edge and top tabs in a single pass. For more information or to purchase a new Formax FD 260, FD 280 or FD290, contact Symco Group at 800-878-8002 or email us at info@symcogroup.com. 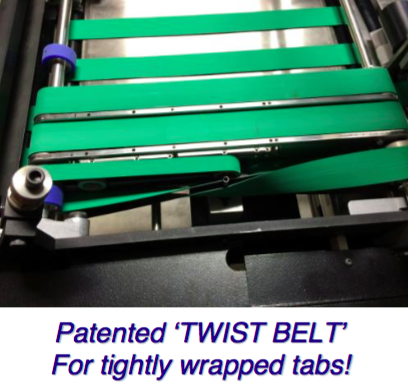 Looking to add, upgrade or replace your tabbing solution? Symco Group is an authorized reseller for Asmarc Accufast for their complete line of Addressing Printers, Tabbers, Labelers, Affixers and more. Contact Symco Group today (info@symcogroup.com or 800-878-8002) to purchase your next tabbing solution. Asmarc Accufast manufacturers several models to fit all your needs. Tabs both booklets and self mailers in the correct spots automatically. Very little setup or operator interaction is required. Select the correct tab mode, load the proper tabs and feed pieces from whatever device you choose on the front end. When full, just clean out the waste and splice on another strip of tabs and go. 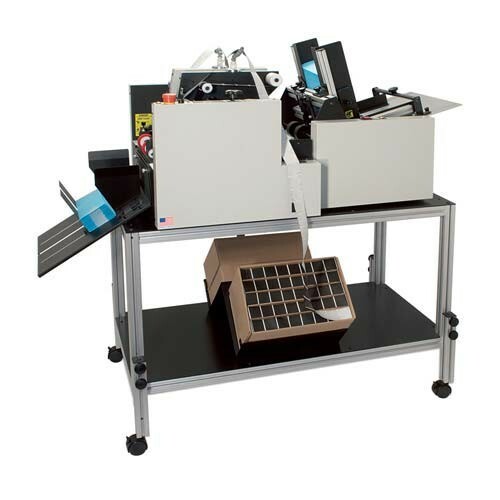 Table top tabber that applies either a 1″ or 1.5″ tab at speeds of 15,000 per hour. The KT is a crash tabber module and must be used with a feeder. The KT is the entry level for a professional level tabbing solution. 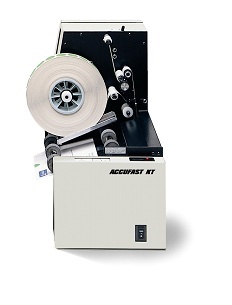 By combining the KT with an FX feeder and CS3 output conveyor it creates a robust tabbing solution for your business needs. The KT2 is the “big brother” to the KT. The KT2 takes care of twin tab requirements on thin forms in a single pass. Each tabbing head works independently of the other as they apply tabs to the leading edge of the pieces moving through the machine. Simple unit with a built in feeder. The Freehand Tabber uses crash tab technology in which a tab is ejected in front of the piece and the piece crashes into it carrying the tab and the piece between a set of rollers where the tab is folded and sealed. The Freehand tabber is a perfect machine if you are only tabbing a few mailers and need a machine to get it done quickly. 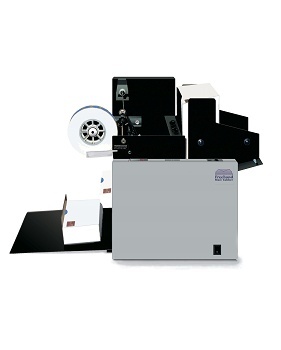 The Slim Jim system is the combination of the of the KT 1.5″ tabber running inline with the Accufast ET. 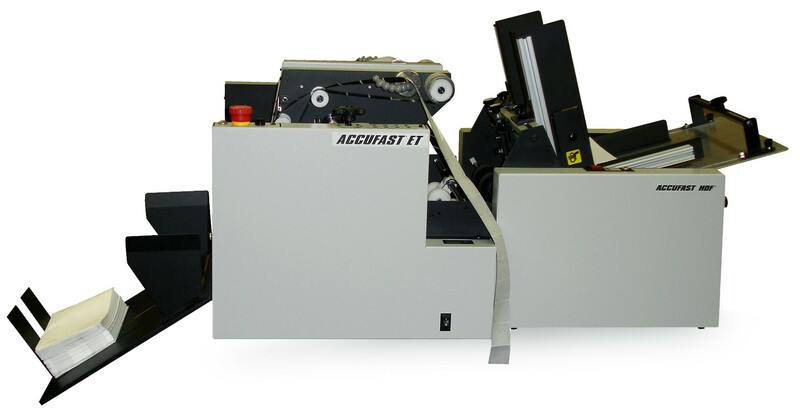 The Accufast Slim Jim allows you to get the extra tab on a side at right angles to the initial side as it runs the piece through the ET and into the KT. Until now rolled tabs were available on either small (5-10,000) or large (40,000) tabs per roll. The small rolls were always running out and the large rolls were hard to handle. Either way, production suffered. 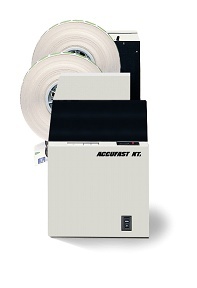 The ACCUFAST LDM handles rolls of at least 75,000 tabs and delivers the tabs to the tabber smoothly and automatically. The rolls are easy to handle and rolls may be spliced one to the other to avoid rethreading (another production killer). 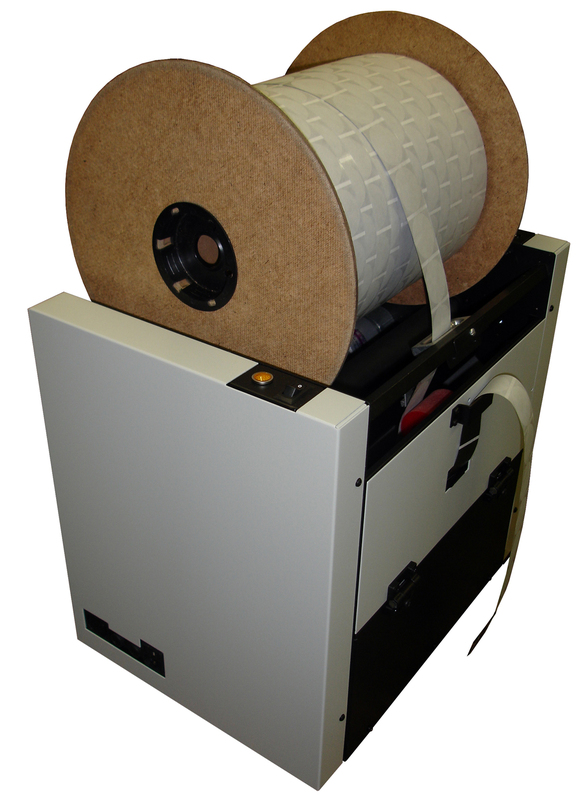 Tabs are wound on a spool which simplifies handling and increases the tab count per roll. An adapter kit allows he LDM to be set up to run pancake rolls of less than 12 inches in diameter. This allows a mailer to use up his supply of old tabs prior to switching to the ACCUFAST spooled tabs.